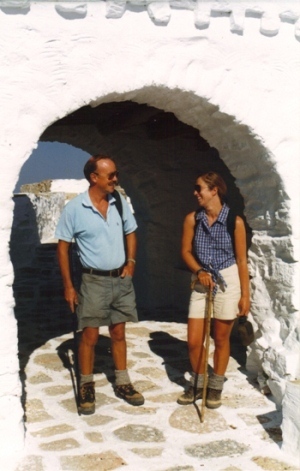 Paul and Henri were the founders of 'Nature Trail Amorgos' which was established in 1999. This diversified into Special Interest Holidays International, of which they are directors, in 2001. They are both retired Royal Air Force officers. Paul completed 16 years of military service retiring as a senior officer and then went on to be an airline pilot. Henri spent 8 years in the Royal Air Force initially as a nursing sister and then made the unprecedented step to become an Air Traffic Control Officer. She is also a historian. In the Royal Air Force Paul organised and implemented Royal and Ministerial flights. The extremely high standards required for these operations are reflected in the execution of the business on Amorgos. 1999 was a time for a life style change. Their book 'Out of the Rat Race Into the Fire' was published in April, 2012. 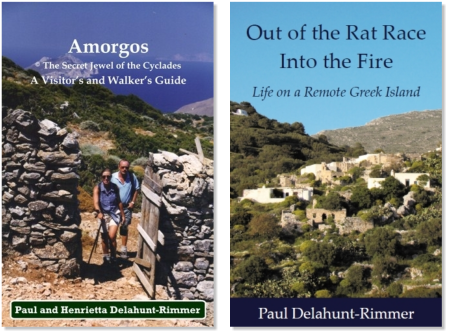 Although they were familiar with Amorgos they researched many other Greek islands to set up on as the ideal place for Nature lovers and walkers. Amorgos won hands down. Ever since the inception, over 50% of their clients have contacted the company to thank them for their holiday. Special Interest Holidays is dedicated to Eco-Tourism. 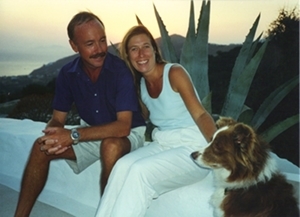 Using his business qualifications Paul is a consultant in the matter to the Eco Club, the local council and is working with Elliniki Etairia who is committed to the preservation of nature in Greece. He has written academic papers on the subject and has been asked by the EU for his opinion on matters. Practicing what they preach they live up in the mountains. They have no road, mains electricity, water, sewage or gas. The local people think that they are slightly deranged but are impressed by their dedication. Only by meeting these people and their staff can you really get to know about the island. Many of their clients have wondered about their own life styles when returning home! We are very proud of the fact that Special Interest Holidays has been voted by the Sunday Times as one of the 100 best worldwide holiday programmes and recommended by the Daily Telegraph. We have featured in various magazines, newspapers and on the television.